Mudra means ‘attitude’, ‘symbolic gesture’ or ‘seal’. A mudra can be a whole body position, or relate to different parts of the body, but here I will cover some common hand mudras. Basically the idea is that the mudra links the annamaya kosha (the physical body) to the other subtler koshas via the prana in the nadis (energy pathways/meridians). Nose-tip gazing, for example, is a mudra. 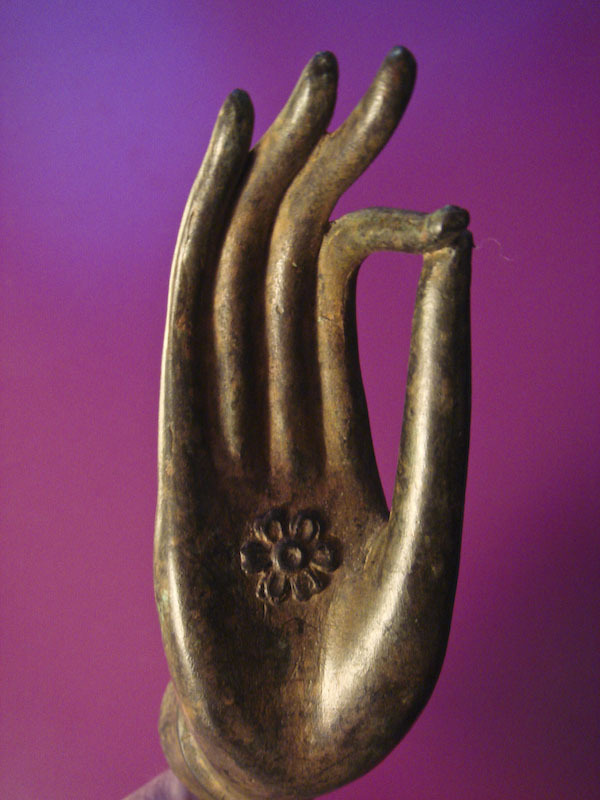 Mudras can occur spontaneously – it is a two way process. A subtler kosha might affect the physical body and cause the hands (for example) to adopt a mudra naturally. I remember this happening to me memorably when I was once assaulted in India and my hands flew up into a ‘’mudra’’ which for some reason was read by the assailants as significant/dangerous and they fled….so who knows.. …..
Mudras affect the bio-plasmic or pranic body. Much prana discharges from our finger tips (This in fact is why eating with the hands is supposed to be healthful..there is a return of prana from the fingertips into the mouth). Kirlian photography shows that the fingers give off flares of energy, whcih are dependant on mood, health, weather (electrical conditions). Mudras are a way of redirecting pranic energy inwards. ….closing the circuits, in a way, (for those electricians out there). It is said that by halting the dissipation of prana by the use of mudra the mind more easily turns inwards. Mudras activate the nervous and glandular systems of the body (via prana) so that dormant psychic energies can be awakened. Abhaya or Shanti Mudra is the simplest mudra of all..when we raise our hand in greeting with the palm facing forwards and the fingers pointing up. It signifies peace. Openness. An absence of threat and is recognised across all cultures. Gyana Mudra (wisdom mudra) is the one we are most familiar with from statues of the Buddha and so on. The Index fingers of both hands fold so that the tips of those fingers touch the root of their respective thumbs. The other three fingers are straight and slightly separated. The hands rest on the knees, with the palms facing downwards. Alternatively the tip of the index fingers could touch of the tips of their respective thumbs. In this mudra there is much symbolism. The three straight fingers represent the gunas (or primal forces that affect us), rajas (action), tamas (inertia) and sattva (balance). The bent index finger represents the individual consciousness which is transcending these states (the jivatma), and the thumb represents the all pervading consciousness, the Divine Reality behind all things, and the connection represents the individuals union with that. Chinmaya Mudra (manifested consciousness mudra)is again the same arrangement of the index fingers and thumbs, but in this case the other three fingers fold in softly towards the palms of the hands. Palms can be placed either facing up or down. This mudra is said to influence the prana and the breath in the thoracic area. Aadi Mudra. (primal mudra) Make the hands into a loose fist with the thumb on the inside. Again hands face either up or down on knees. This mudra is said to influence upper chest breathing. Brahma Mudra (all pervading consciousness mudra). Place the two hands which are already in Aadi mudra (above) and rest them in the lap and bring the backs of the knuckles together. The thumb sides of the fists are facing away from the body. Place both hands like this in close to the body, on the level of the pelvic bone. This mudra is said to help develop full yogic breathing (combination of abdominal, thoracic and clavicular breathing in a smooth, effortless, wave-like breath). Bhairava and Bhairavi mudras. These are particularly lovely and often arise spontaneously in many people. One hand is simply resting open on top of the other hand and both hands rest facing upwards in the lap. Bhairiva is when the right hand (the male side of the body) rests on top of the left hand, and Bharavi is when the left hand (the female side of the body) rests on top of the right hand. Bhairava is a powerful form of Shiva and Bhairavi is his consort, Shakti. TATTWAS – In the science of mudras the thumb represents the fire element, the index finger, air; the middle finger, ether; the ring finger, earth; and the little finger, water. For Prana vayu – place the tips of the thumb, middle finger and ring finger together. For Apana vayu – place the tips of the thumb, index finger and middle finger together. For Samana vayu – place the tips of the thumb, little finger and ring finger together. For Udana vayu – place the tips of the thumb, index, middle and ring fingers together. For Vyana vayu – place the tips of the thumb and all fingers together.. These above mudras are used in the science of pranic healing, whether for self or others. Yoni mudra (womb or source mudra). 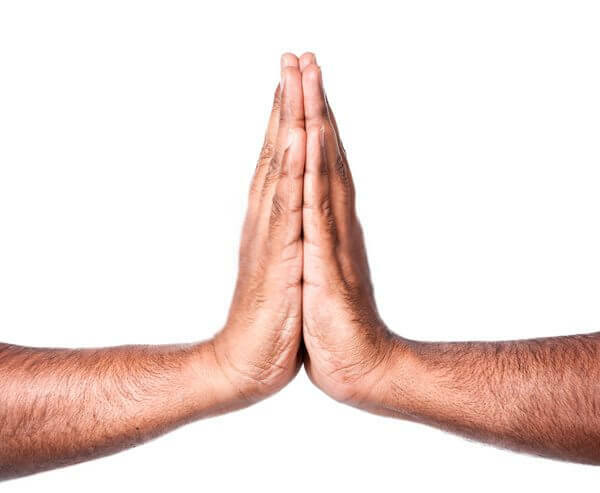 Place the palms together, fingers straight and fingers pointing away from the body. Bend and interlock the middle, ring and little fingers, so that index and thumbs are now straight. Move the palms apart, and turn the thumbs back to face the body, so that you create a ‘’diamond’’ shape between the thumbs and index fingers. Rest the hands in the lap. This mudra is representative of the primal generative energy. It is said to balance ida and pingala nadis, and the left and right sides of the brain. Please note : There are variations in the practice of yoni mudra, though the diamond shape of thumbs and index fingers remains the same. Hridaya Mudra (Heart mudra)… a truly lovely mudra. Fold inwards and place the tips of the index fingers at the roots of the thumbs. Join the tips of the thumbs on either hand to their respective middle and ring fingers. Let the little finger remain straight. This mudra influences anahata chakra, and is said to improve the vitality of the physical heart. It is to be used during emotional crises to steady the emotions. 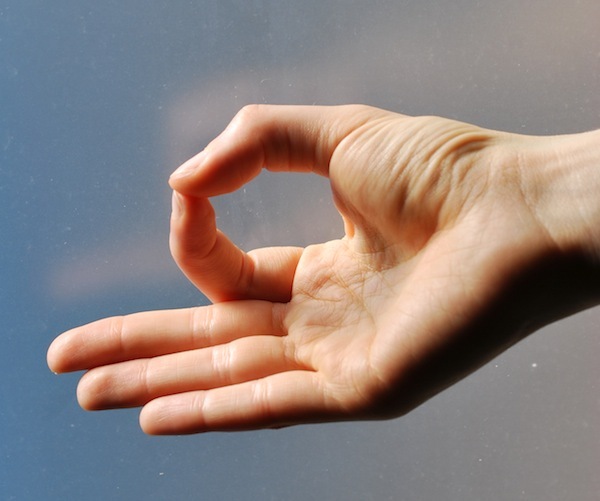 Shoonya mudra (the attitude of ‘voidness’) is often used in Buddhist practice. The palms are flat open on the lap/knees facing upwards, the thumbs a little away from the fingers which remain together. The hands are relaxed though open. It represents the state of totality, of oneness, devoid of ego, devoid of craving. The void which is the All. There are loads and loads of other lovely mudras. This is just covering some common ones. Kashyapa Mudra symbolizes tortoise, union of masculine and feminine and Sage Kashyapa (Hindu mythology). Like tortoise it creates a seal against negative energies. Use it when you find yourself in conflict situation or when among the group of negative people. You can hold this mudra when visiting places having dark past. Like union of masculine and feminine, this mudra helps in creating balance and grounding. Prithvi Mudra – to treat fatigue, provide nourishment and stability Prithvi Mudra restores energy in the root chakra. Prithvi mudra increases earth element in the body, thereby providing nourishment to all the organs having deficiency of any sort. Prithvi mudra is good for bones, skin, cartilage, nails and hairs. It provides stability to people who are weak and frail in disposition. It helps in gaining weight, treats chronic fatigue, osteoporosis, dry skin conditions, hair fall, premature graying of hair, brittle nails, burning feeling and inflammation, fracture (for early healing), stomach ulcers and fever. Prithvi mudra stimulates body temperature and liver. It is extremely good for people who have excessive heat (bile) in the body (Pitta types). It helps to control their anger and increase patience level. You simply have to join tips of ring finger and thumb. The other three fingers remain extended. Vajrapradama Mudra symbolizes unshakable confidence, and practicing it can remind you of both your personal power and your faith in something greater. Practice this mudra in Vajrasana (Thunderbolt Pose) to let go of self-doubt, mistrust of others, or hopelessness in the face of obstacles. Physically, it opens and decongests the frontal sinuses. The Hakini Mudra in Yoga can be described as a gesture in which you need to join the tips of the five fingers on your right hand, with those of the left. It is said that this mudra, which is named after the God Hakini, helps boost thinking and concentration. It is believed that this gesture is linked to the Third-Eye Chakra, where your imagination and intuition are located. The hakini mudra is useful when you have forgotten something momentarily and wish to recollect it. Ksepana Mudra helps in releasing negative emotions, pent up energy and toxins from the body. This mudra helps in elimination through skin (sweat), lungs (exhalation) and large intestine. Do it for 2 minutes, hands facing downwards towards earth and see the recharged you. Kamajayi Mudra helps in conversion of sexual energy. The outflow of sexual desire (Kama) and passion through senses is directed inwards and upwards thereby helping in elevation of creative and spiritual faculties. You can do this mudra while walking, sitting or lying. To do this mudra, you need to press the nail of the thumb with the tip of index finger. The remaining fingers remains curled and at ease.